Why are we talking about copyright again? How does US-style "fair use" differ from current UK law? Mike explained. "Your work under US law can be used for purposes such as critique, classroom research." In UK law, fair dealing "allows specified uses", for some of which copiers must pay to collecting societies. Specified uses include Braille editions and libraries. Fair dealing provisions are "compatible with international law" laid down by bodies such as the EU and the World Trade Organization. Mike notes that in the digital age "every child now in school will be a published author... the debate is not as it has been presented," it's about the right to be identified as the creator, and to defend the integrity of the work. We also need a level playing field in negotiations. Current law is based on the fiction of "sitting around a table with Rupert Murdoch." UK law recognises it is "appropriate to regulate contracts where there is a vast disparity of power" (such as between landlords and tenants.) Mike concluded, "without that support, us getting a fair share, the creative economy is over. So give us some money." Ivan Lewis MP (Lab, Bury South,) Shadow Culture Secretary said "the creative industry one of the biggest success stories in recent years", and will be increasingly important as we try to "rebalance the economy" to reduce dependence on financial services. However, many are signalling that UK Creative Plc "is in peril", with technology "moving on copyright faster than legislators can handle." With technology making enforcement harder, "we need to send a strong message about the abuse of copyright that's now taking place" and "recognise the changing environment but there must be certain non-negotiable principles" said Ivan. "If copyright continues to be stolen," he concluded, "it will have a serious impact on our economy." Author, broadcaster and CRA president Joan Smith noted "the puzzling disappearance of the creator... people assume photos just appear. These are not theoretical products, they are attached to people." The Irish copyright review announced by former Taoiseach John Bruton has five paragraphs on digital companies but no mention of authors, Joan noted. Gwen Thomas, legal and business director of the Association of Photographers, reported an increase in moral rights waivers, photography rights grabs and "all rights plus indemnity" contracts. Gwen added that "our moral rights legislation has no teeth - it's way behind the rest of the EU... We constantly hear from publishers that they need the power of the (moral rights) waiver - strange that countries like Germany that have strong contracts have a healthy publishing sector." She proposed legislation to "punish those stripping out meta-data". 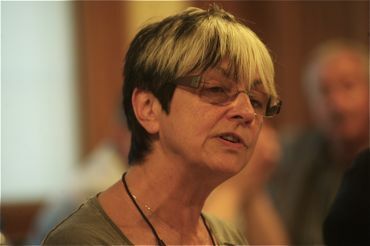 Nicola Solomon, the new General Secretary of the Society of Authors, said it's currently far too expensive for creators to enforce copyright law. The forthcoming Intellectual Property County Court still has legal costs to the claimant - a deterrent to victims of piracy owed, say, £500. And "a sanction isn't a sanction" if the offender only faces a take-down and coughing up about what a legitimate licence for the work would have cost. Our host John Whittingdale MP (Con, Maldon) Culture Media and Sport Select Committee chair, confessed to "taping the Top 20 as a teenager". But the loss to the industry from home taping, and from bootleg tape car boot sales targeted by Department of Trade and Industry raids he later accompanied as an MP - were "small compared to current digital piracy". John added, "industries depend for survival on enforcement of copyright." John "critically supported" the Digital Economy Bill - "far too late in the day, far too little debate" - especially on "the impact it would have on photographers." 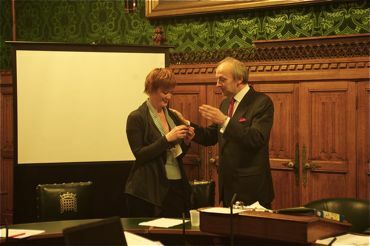 The House of Commons meeting also saw the long-delayed presentation of an NUJ Gold Badge to LFB member Heather Brooke (left) for her work on freedom of information. 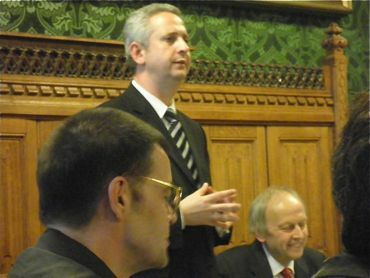 LFB chair Dave Rotchelle (right) said that it was Heather's original Freedom of Information Act requests that triggered the whole Parliamentary expenses scandal, so the venue for the presentation was appropriate. Several speakers called for more education on copyright. Nicola said, "if people don't have the basic knowledge of copyright they can't be expected to respect it." John said, "the challenge is to change the minds of the next generation on copyright", referring to "encouraging research (that) shows that attitudes are beginning to change."